The Fairbourne Railway has been running from Fairbourne village to the mouth of the Mawddach Estuary, connecting with the ferry to Barmouth for over 100 years. It started as a two foot gauge horse-drawn tramway which was then converted to a 15 inch gauge railway in 1916. The line, in 1984 was completely re built to a 12.25 inch gauge. 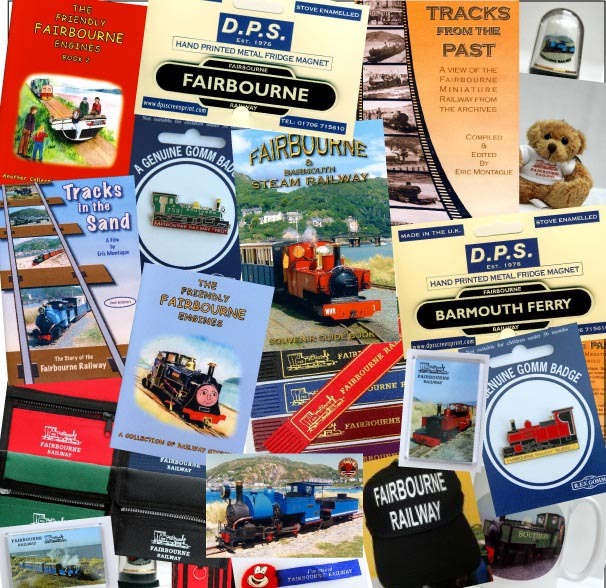 See the"Railway Information" page for more information on the history of Fairbourne Railway. TO FOLLOW US ON FACEBOOK. CLICK THE BUTTON. Please take the time to browse our shop. Most of our items are collectables and are of limited supply. Please be aware that postage costs have been calculated for UK delivery only. Should postage be required outside of the UK please email us first for a quote. The email address can be found at the bottom of the page. Please read the Terms and Conditions before making a purchase. During the railway's closed season goods may take a little longer to dispatch but rest assured, your order will be on its way. Should you require your order sooner please email us first before adding any items to the cart. The email address can be found at the bottom of the page.